We've been picking on Bristol University for a bit, which is unfair. They have a staff-pay-to-park policy in their limited parking spaces, no-student-parking, and even cross-charge the departments for their vehicles parking permits. Most students at the university probably walk there. But UWE, out on the fringes, is a different story. It's very isolated. Some people walk, but otherwise -bus, bike or car. The U1-U5 buses are fantastic, and as students who live on-campus get free bus permits, their existence must help reduce the number of students killing themselves from being stuck in an industrial estate somewhere near parkway. Time for a closer look. Here is the Coldharbour Lane shared pavement.. The Cyclists Touring Club are very critical of pavement cycle lanes, as they are so inordinately hazardous at the junctions. Is this lane safe for bikes? Well, there's an expectation that you cycle on the right of the pavement, which must help foreign students blend in. But you are expected to pull out and cross a junction -does it have signs warning traffic out of this housing estate about the risk? Further south, the same thing: the path just has a give way -not a stop, just a give way- that pushes you straight under cars. Nice. And, because bikes heading in both directions are expected to stay on the same side of the pavement (white line -no crossing), there's the risk of a head-on collision with oncoming bicycles. Do note that bikes are given give-way to pedestrian signs near the pedestrian crossings. Whoever designed this lane must have been concerned that some bikes may survive the first two junctions and so threaten pedestrians, hence the give way. There are rumours that much of the Cycle City funding is dedicated to such lanes. These particular pavements are in South Gloucester -a council that seems very fond of shared pavements, dual carriageways and roundabouts. We will have to explore nearby, to see their most recent development. These signs may appear to be positioned just to catch out cyclists, but at least pedestrians won't hit them. More importantly, nobody should cycle down that bike lane. If you are turning left, occupy the full left-hand turn lane to avoid getting clipped at the corner. If you are going straight on, occupy that same lane, but go on straight. The bike lane is for cylists who are tired of life and wish to die on Stokes Croft rather than in a mountain biking adventure that would make for a popular youtube download. The sign forces people out early, and so keeps them alive. Looking in the other direction, there's a van outside a building site occupying the northbound lane. A bit more of an inconvenience. But not much. Not really, as the roadworks bethind the lorry have already taken the lane away. Given how further in to town these lanes are alway occupied by parked cars, we really have to question the value of these lanes. If it is for cyclist safety, then a 20 mph speed limit would actually work and allow people doing deliveries, roadworks, parking outside their shop, etc, to get on with it. All the bike lane does is create unrealistic, unsustainable expectations by both cyclists and drivers. This site is not satire or sarcasm: it is documentary. When we praise someone for finding a new solution to the problem of where to leave their chosen transport option when not in use -we mean it. We do like novelty and entertainment, however, which is why we despair at the sight of the Montpelier Range-Rovers every time one of us passes Picton street -what else is there to say about them except give them names and try and spot them parked anywhere else in the city? But look sideways on -you can see that even when another pedestrian has squeezed past, the front of the car is still a car-length away from blocking the pavement. This car's driver has given up trying to find a space in the part of Clifton that opted not to become resident's parking, and just stopped in the road. It's not far off that Will Smith zombie film where everyone pulled over to the side of the New York streets before turning into flesh-eating killers, leaving Will Smith to drive round the empty roads at speed. Looking from Eaton Crescent, the sheer boldness of the parking manoeuvre becomes apparent. The car is just stopped in the middle of the junction, seemingly left there all night. To turn left here you will have to swing out into the oncoming lane then pull out slowly, visibility being done for in the process. This is more than corner parking, it is a whole new concept, something like "random junction parking", though sadly that isn't as catchy. But think if the idea does catches on? Right now, every corner: room for one more car. With this, two cars. Really wide junctions, three cars. The best bit, if enough cars park over the junction, then it becomes a de-facto shared space/home area. Clearly, this piece of innovative parking is a profound new development in the city's portfolio of places and ways to park. Is it a coincidence that this new way to implement shared-spaces gets rolled out the same week we get a new local government? We suspect not. There's been some debate in the comments as to whether its the faster German cars that tend to be the ones that park the worst. We don't have enough unbiased data. We do think that 4X4s park badly, but that's for physical reasons: they are wider and reverse really badly -you can't park them into small spaces and are forced onto the yellow lines and the pavements. German cars are just like any other: they need somewhere to park. Here in Clifton, this BMW H837GLM has found a nice spot on the pedestrian buildout on Royal York Crescent. That could be endangering pedestrians. Someone might try crossing from the other side of the road, and not be able to get safely onto the pavement. That could be hazardous. Fortunately, a driver of a BMW Mini has seen the risk and selflessly parked their car YH57URU in such a way as to block anyone from running out. Only a small car like a mini would be able to parallel park on this buildout -it has done it without damage to its wingmirrors or bodywork. Nicely done. This is a German brand, but the Austin Mini comes from Cowley, 100+ miles or so east of Bristol. Does its presence on the pavement prove or disprove the "fast German cars park worse" hypothesis? They even have a smaller van than most building firms -one that is slim enough that they can leave it on the pavement. This being a Sunday afternoon, WX08SXB has probably been sitting there for 24+ hours, which will incur no environmental costs. In a surprise that shocked the city, FirstBus resigned its franchises of Bus and Train services to the city. In a terse management announcement, it was stated that this was forced due to debts incurred in other parts of the FirstGroup business, namely the spectacular collapse of its entertainment business, whose service of organising drinking sessions in breweries and parties in brothels failed recently. The train franchise will be taken up by Deutsche Bahn, while bus transport will be handled by city-link taxis, whose drivers do know when trains arrive at templemeads, and hence when to have buses there. Elsewhere, Bristol Traffic and the Association of British Drivers condemned the appointment to the local council cabinet of someone who is known to ride a bicycle. Cllr Jon Rogers, here seen attending a cycle city launch event, was spotted talking politely to the cycling activist Steve Meek (seen on the left), rather than beating him soundly with a large stick, as the ABD have been advocating doing to all cyclists. A Bristol Traffic spokesman said "why appoint a cyclist as the cabinet member for transport? He will not understand the real traffic problems in this city, such as how the addition of a few thousand more parking spaces and two pedestrian crossings near cabot circus have brought traffic in the centre of this anti-car city to a standstill"
Bristol University, flagship college for a Cycling city, is threatening to clamp bikes parked where they should not be, while leaving cars alone on their property, and allowing their own vehicles to park on the pavements elsewhere in the area. What bike parking do they provide? There is actually some secure parking in the sports centre -you need a membership card to access it and we have not yet seen inside. We can take a look at the covered area outside the physics building. Since the bike and motorbike parking behind the physics building was removed (it's now building works), this is all there is on this side of the road. It's covered, and running at about 80% capacity at 10:00 on a Wednesday morning. But wait -what is that sign on on the wall? It's another notice. It is from the university security and says "your bike will be stolen" - 41 bikes were taken in Autumn Term 2008, average bike value 300 quid. That's not much for a good mountain bike, hence the obvious lack of hydraulics in the brake levers. But it is a lot if you are a student who doesn't have a trust fund set up by your parents. Your bike gets nicked, there goes your transport. There we have it then. University security parked on one side of the pavement, warning signs of bike clamping if you park on the (not that secure) fencing, and clear evidence that wherever you park here, if it isn't the secure park, its going be gone when you get back. Taking a look at the other side of the road from the Bristol Traffic Helicopter, we can get another view of the key parking issues of the area. In the foreground, five cars in the pay and display short stay parking. The people I all saw arriving were students -ones with money, obviously. But if mum and dad get you a car for your 18th birthday before you go to Bristol University, money for parking for one lecture a day is probably manageable. Behind the cars, on the left, a de-facto motorbike site. They've lost their parking with the building works. nine to ten bikes, taking up less area than the five cars in the foreground. Behind the cars, on the right, more bike parking. possibly twelve sheffield racks, twenty to twenty-four bikes. Notice something unusual here? There is more area allocated for short stay parking for five cars than ten motorbikes or twenty bicycles. The sheer possibility of short-stay parking means that those students who have the money have the option of driving to lectures, forcing them to park over corners on Highbury Villas when that fails. If someone were to turn those short stay parking areas into bike parking, there would be room for another 40+ bicycles and, by removing the option of driving to lectures, supress road traffic. Now, one could hope for cycling city funding for this, but there's another option, isn't there? For the university cyclists to take over the short-stay parking area as a protest against the university removing all their parking spaces. It might also make a fun place for a critical mass ride, though there is the small detail of the hill climb from the centre to deal with. This is pretty skillful. It's not the fault of the locals that the anti-car council won't give them a proper pavement to park on, yet they do the best they can with the narrow kerb. Keeps the car clean, and the grass green, though it means that the passengers will still get muddy feet. 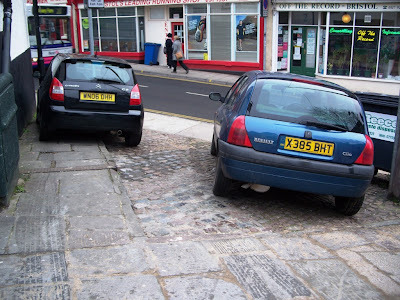 When will the council give Lockleaze proper pavements for its cars? 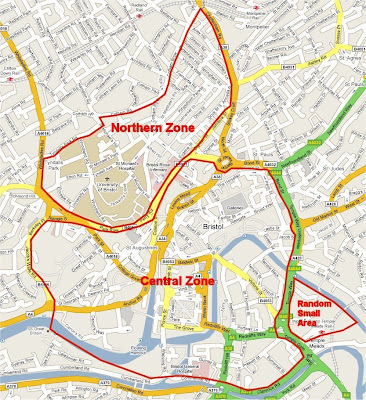 The central zone isn't surprising, but the Northern Zone is. All of that area but the Nugent Hill area will be in the RPZ. Assuming that goes ahead, and the residents get free entry (not guaranteed, because the RPZ map includes the southern side of Cotham Road, but this C-zone would only work with cameras on St Michael's Hill and Cotham Road South, those being the main entry points. A camera would be needed at the end of Kingsdown parade too. With Horfield Road in the C-zone, there is no way to get from Cotham to the centre except via Whiteladies Road or Gloucester Road. With Arley Hill and Elmdale Road in the C-zone, there is no way to get to Whiteladies Road or Gloucester Road except coming in further north (Aberdeen Road, Zetland Road) and then turning south. So this removes all incentive to drive through the area to get to or from Park Row. Given the area will all become RPZ, the through-drivers could be addressed by four ANPR cameras -at the St Michael's Hill/Park Row junction, Woodland Road/Park Row, Arley Hill/Gloucester Road and Elmdale Road/Triangle. Make them red-light/speed cameras too, for the fun of it. It will be a tax on everyone from Cotham and Redland who drives to the North Fringe via Kingsdown-St James-Barton-M32, but not if they go on Kellaway-Avenue and Filton Avenue. The proposed C-zone also targets one group not affected by the proposed-RPZ -university car parking in the A-B-C car park zones and nearby pavements, and BRI staff. Given the university have just clamped down on bicycles parked out of their -overflowing- bike parks, it's hard to feel sympathy. To be fair though, to get a staff permit to use their parking spaces costs a few hundred pounds a year, and the permits are limited, so a lot of staff don't bother, they park-and-walk for free. As for the BRI, it's pushing for extra staff parking. They may get it -at a price. Last week: Free Monty. This week, the Unionists push back. There's some new signs up outside the Physics Building -the one that looks a bit like a castle and is visible for miles round the city, a symbol of a city -the symbol of A cycle city. The signs say :No Cycle Parking. They don't say who is doing the thanking, or why you are being thanked. The key thing is that you are not to park your bicycles to the railings outside the physics building, or on street signs outside. There is some covered parking nearby, behind the car AK55AEA that appears to be blocking the entrance to the bike park - a car that our database searches show was recently sold for 5500 quid in Eastbourne. One question: will the rules against bicycles be enforced? After all, parking of workmen's vans YK54JZT and BP06NCU in the two disabled parking spots doesn't seem to be crime worth punishing, but maybe bicycles are deserving of special treatment. After all, they belong to the troublemakers. It first showed up in our Entering Free Monty posting, now it is time to cover the issue in more detail. Bristol Taxis are now required to have a standard colour, Blue. This will distinguish them from minicabs, which can retain their grubby beige colour. Here are some of the new taxis, SH08UCV and SH58PHV, sighted in Alcove Road, Fishponds. When you compare it to the taxi across the road, W502PHY, the new colour scheme is a clear improvement. Keeping an eye on the various ops teams of the university. Here's WV54MYB picking up bread from Parson's Bakery, nicely obscuring visibility for anyone who dares to cross St Michael's Hill anywhere but the zebra crossing. And here's the pavement on Tyndall's Avenue, where the security vehicle WU56JPO is resident. This may be legal; depends on whether this part of the pavement is uni property -the pavement is lowered here. What it does, legal or not, is give the impression that the university approves of pavement parking. Which it clearly does seem to do. Why the attention to the university? Because of recent changes in their bike parking policy. There's lots of online gossip about council plans to turn Stoke Park into a cow field. There are some interesting environmental and economic details, but we are more worried about the social costs of the plans. Stoke Park is the primary off road motorbiking destination for North/North East Bristol. Southerners have the trails of Dundry, residents of Lawrence-Dubya have the wastelands of Severn Beach, but only here in Stoke Park is a place for residents to come with their family and go off-road. Here's a lovely summer photo from a rare dry day last August, with a family all out enjoying a bit of motorbiking on the grass. The park connects with stapleton, you can get all the way to Lockleaze or Purdown camp. It is an integral part of off-road motorbike enjoyment of the city's greenery. This is not compatible with cows. Some people may say "good, the bikers shouldn't be there", but there is bugger all else to do in Lockleaze; every kid out there is someone who isn't stealing cars or taking drugs. And you know that advert for the army showing soldiers driving around off-road in a landrover in the dark? These bikers can do that -which is the kind of skill the army looks for when recruiting. Given a choice between the motorbikers of lockleaze and the cows of Stoke Park, my money is on the motorbikes. Remember the gold old days of the boom town? When being an estate agent was easy: put up the advert, handle the bidding war, rake in your 7.5% ommision for no real effort. Those days are over. Now, you have to drive round the city, sell the products and then sprint over to the next deal. Here we see a Hootons estate/letting agent car VO54WNW parked while it tries to bring in a bit of business. And again, another day, elsewhere in Kingsdown. It's hard not to feel sorry for these people, it must be pretty stressful. And since there aren't going to be any legitimate spaces here, double yellow lines are all they have. One question though: why the pavement? Maybe it's to get the attention of pedestrians. Every customer counts, these days. The Audi TT V960JBH has managed to take advantage of the lowered kerb and so get onto the pavement without threatening the bodywork on the low-clearance toy. And its wing mirrors are well protected from passing cars. "Standards remain well below average at Key Stage 2, Key Stage 3 and Key Stage 4." So said Ofsted in their letter to Heather Tomlinson, (ex) Director of Children and Young People's Services at Bristol City Council on 17/12/2008. The evidence would suggest that there are significant numbers of motorists in Bristol who can't read. And if you can't read the words, how can you be expected to obey the advice? But... 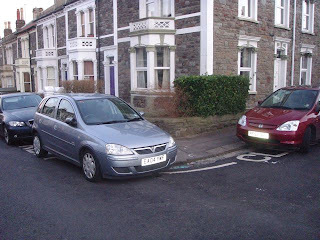 These cars , although safely on the pavement near the Gloucester Road, are not from Bristol. EA04YWF proves that schools in Essex are worse, as does RF52 ODU for areas near Reading (where you really would expect everyone to be able to read). Maybe Bristol is not fairing so badly in the league tables after all. Every day, snaps of pavement parking, stopping in yellow boxes, on yellow lines and other sundry demeanours are recorded by the satellites above us. And some of these images make their way onto Google. But the technology doesn't add to the Database, yet. However, Google Earth can also help us understand many other things. 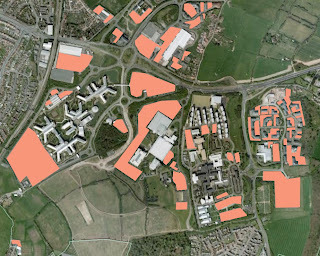 Like just how much land we give to surface parking north of Bristol. This is a random screen grab and a totally un-scientific Jackanory-style exercise in colouring the land available for the storage of cars. There's no funny punch-line to this post. Contributor "IW" posts these in, cars parking on the extended parking area at the junction between Horfield Road and St Michael's Hill, alongside that fine tavern, the Scotchman and his Pack. 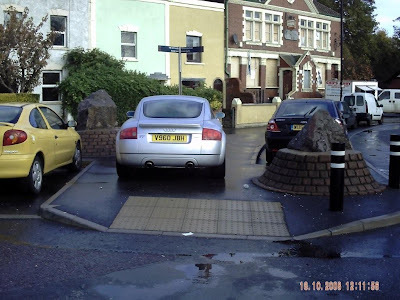 "IW" thinks that they may be associated with the running shop across the road, and while the car X385BHT may be parked on some bit of cobbled driveway, the other one, WN06OHH is on the pavement. Well, that's one that will take a close looking at 1:1500 maps or something similar, but anyway, it's moot. If they are associated with the running shop, they are parked there for a reason. When you get shoes from that shop, you can go out and run up and down the hill to see if they work on your feet. The uphill/downhill stretch tests the shoes absorbance and springiness. Which is not enough for urban bristol running -you need to be able to swerve round cars on the pavement, which means you need good turning abilities, adequate traction, but not too much friction. By parking cars on the pavement, the shop may be providing a more realistic test facility for their customers. The police ticketing of vehicles extends to more than just one taxi making it hard for passing cars, they have also visited the pavement of Upper Cheltenham Place. This van T138RTA will go down in history as a vehicle to get a ticket purely for completely blocking the pavement of a quiet back road. Where else is there to park a van in this area? Similarly, the golf M554KAA which is always positioned here now gets to pay £30 for the right -a number which, amusingly, is not that far off the proposed annual residents parking fee had the area voted to become an RPZ. It is going to be interesting to go by next week, next month, to see if there's been any change in driver behaviour, or whether it is an aberration. Meanwhile, over in Brislington, residents are requesting police enforcement of parking and yellow-hatched-junctions. This is a dangerous trend. Leafleting cars on the pavements is one thing, are the police really going to turn on the car drivers and start persecuting them? This photograph is going to become one of those timeless pictures, the taxi NK55KYC given a ticket and a £30 fine for parking on the pavement of York Road. Nothing like this has ever happened before. For Montpelier, this is as profound an event as it was in Northern Ireland when the army came in from the mainland in an attempt to impose order and provide an impartial police force. The whole Northern Ireland low-intensity civil war theme is such a source of content we have to keep milking it for all it is worth. Today, The Troubles. If you talk to the unionists, they pine for the days before the Troubles began, when they could march their Orangemen marches and the Catholics would come out and join in and everyone was happy. If you talk to the nationalists, they tell you how they'd stay in their cottages on the Garvaghy Road, in fear of the marches. From their perspective it was their attempt to mimic the US Civil Rights movement -and the unwillingness of the opposing party to adapt- that led to them adopting that other popular US idea: firearms, and so The Troubles proper began. What is key is this: attempted assertion of legal rights led to 30 years of armed conflict. Here in Montpelier, 20 Feb 2009, something happened that may well be as significant. The PCSOs are going round ticketing cars. Here is Brook Hill -three cars on the pavement have notes on their windscreens telling W763VBO and VA53LVC amongst others to stop parking there. This is persecution. The cars WR56YZM and DY02UXL have historically acquired the right to park on the pavements and on corners. Yet, here, on Fairfield road, all around this quarter of the city, the leaflets are out. And more than just the leaflets, the tickets. What has happened? According to conversation with the PCSOs someone -and we think we know who they are- has been complaining to the police about the issue, and the police -not Bristol Parking Services- has come out to act. This is exactly the kind of assertion of rights that leads to trouble, or even worse, The Troubles. Another phrase that brings visitors to this site is "secret parking"; people searching the web in the desperate hope that whoever has discovered a secret parking space somewhere in the city is going to write about it, rather than treasure their secret for use in emergencies. Well, that's going to change. Bristol Traffic is going to document those secret parking spaces. We may charge for sharing our knowledge of special-secret-parking-spaces, in fact our contributors can feel free to charge to delete the photographs, so if you want your secret parking space kept secret, it may cost you. Here, secret parking for Cabot Circus, just off the St James Barton Roundabout, a roundabout which, if you look at the city's open spaces plan, actually constitutes open space. By parking here, you get a pleasant walk through an open space, then "Discover Broadmead" before arriving at Cabot Circus. There's plenty of room here, no risk of passing pushchairs scratching your paintwork, whether your car is big or small. Access looks fairly straight forward: approach the roundabout from the BRI, pop up on the pavement and nip through this gap in the railings. Exit is, presumably, the same way. This is probably the only tricky part of the operation, especially if you want to head for the furthest lane, then you need to be fairly aggressive in your pull out or roundabout lane changing tactics. Despite so much progress towards peace, a republican spinoff group that refuses to accept the peace settlement, Bogside Republican Action Group, has come out and threatened the British oppressors. That is, they have declared that TV license and parking officials are "legitimate targets". This is such wonderful progress. Really. Whereas before, the "oppressors" came in form of army helicopters, armoured personnel carriers and armed foot patrols by the UK Land Forces, and the issue under dispute was whether the 1921 partition of Ireland was accepted as legitimate, now the outstanding issue is whether parking on double yellow lines is a crime. Hopefully this adoption of a common enemy will create unity within the country. Perhaps even the classic songs of either side could be updated appropriately. The Orange Order's song, "The sash my father wore" could be updated to become "The 4x4 my dad drove me to school in"
Even that republican anthem of internment, "The men behind the wire", could have its lyrics updated. Old: ﻿"Armoured cars and tanks and guns, came to take away our sons. But every man must stand behind, the men behind the wire." New: "Derry city council parking enforcement officers came to ticket our sons for illegal parking. But every man must stand behind, the vehicles parked on the double yellow lines"
It is only through such modernisation of both group's narratives that peace and reconciliation can be achieved. Apparently the local police are looking at the threat, and even Sinn Fein have condemned it -presumably because it is their council's revenue which is now threatened. Here on the mainland the concern must be how much ex-PIRA armaments the Bogside Republican Action Group has access to, and whether they have linked up with mainland groups with similar aims, such as Captain Gatso or the Association of British Drivers. Here on the mainland we've been isolated from the Troubles for nearly a decade, and it would be good if it stayed that way. Springfield Road, off Nugent Hill. There's been a collapsed wall here for at least six months; a pile of rubble making it impossible to walk along the pavement. Finally, the council imposed some compulsory maintenance order on the owner of the house, cleaning it up for them and sending them the bill. Which means that it is now safe to be used as a pavement again. Which is exactly what the car N978DFH is doing: using it as a parking area, far enough in that wing mirrors on both sides are well defended. What does that sign on the floor say? Ashton Court: Best Mud for a decade!